PrototypeGerman State Railroad (DR) class 254 of the former GDR. Version in "Bottle Green" paint scheme. Road number 254 069-8. The locomotive looks as it did in 1984. Model: The locomotive has an mfx+ digital decoder and extensive sound functions. It also has controlled high-efficiency propulsion. 3 axles powered. Traction tires. The locomotive has articulated running gear to enable it to negotiate sharp curves. The triple headlights and dual red marker lights change over with the direction of travel, will work in conventional operation, and can be controlled digitally. Maintenance-free warm white and red LEDs are used for the lighting. The locomotive has separately applied grab irons. Length over the buffers 21 cm / 8-1/4". After the end of WWII, 30 class E 94 locomotives remained on the German State Railroad (DR) of the former GDR. From 1970 on, they were designated as the class 254. The class 254 had the nickname "Eisenschwein" / "Iron Pig" on the DR. A maximum speed of 90 km/h / 56 mph could be reached with a continuous performance of 3,000 kilowatts / 4,023 horsepower. 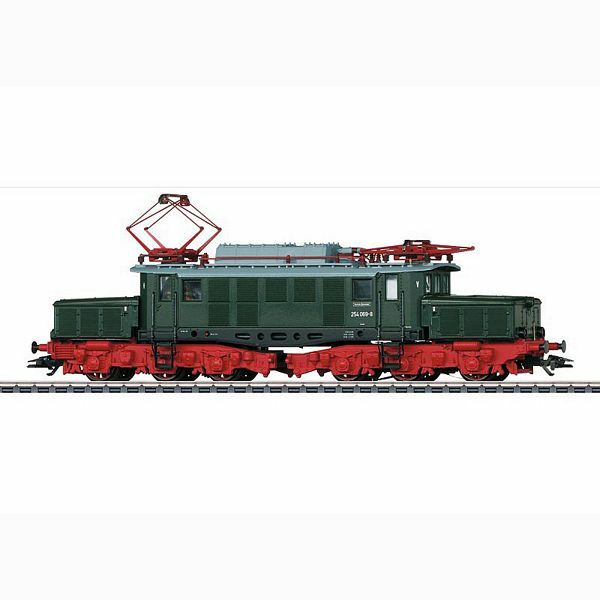 A car set to go with this locomotive can be found in the Märklin H0 assortment under item number 46911.